This shopping mall has everything that anyone could ever want in a mall and if you can not find it here at Eaton Centre in Toronto, Ontario, then you may never find what you are looking for. People shop for hours in this mall as it takes that long just to get from one end to the other especially if you stop and browse in every store. Eatons, shopping mall, Einkaufszentrum, Toronto, Ontario, Canada, North America. 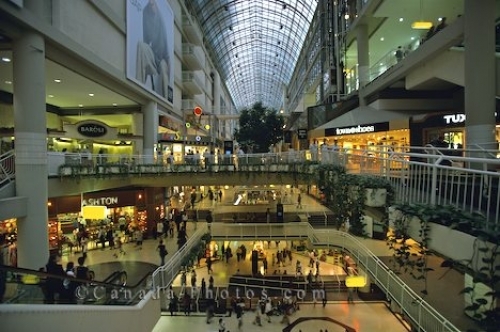 Picture of the levels of stores at the Eaton Centre shopping mall in Toronto, Ontario in Canada.